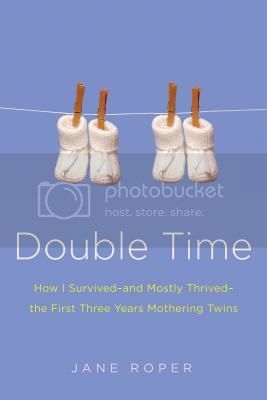 Hey, remember about this time last year when I was loving on Jane Roper’s Double Time: How I Survived – and Mostly Thrived – Through the First Three Years of Mothering Twins? Being pregnant with twin girls of my own at the time, I found it reassuring to read someone else’s account of motherhood of twins. Roper’s story is more than that, though, it is about the stresses and joys of parenthood, as well as a very personal account of mothering through depression. I ended up choosing Double Time as one of my picks of the year for 2012, and given that I still find myself thinking about it and Roper’s experiences from time to time, I think it was a particularly good choice. Well guess what? Double Time is out in paperback TODAY and I just happen to have a copy to give away to one reader with a US mailing address. Just fill out the form below by 11:59 pm Central on Monday, May 6th. I am the genetic lottery for twins, so when I have them (sooner rather than later), this is a possibility. I hope I win! Thanks for the second chance. Maybe the second time will be a charm! Thanks…..